Before we go into the ins and outs of how the machines work, we’ll remind you of what the process actually entails to help you understand what is required of the machine. Injection moulding is a process that produces a high volume of plastic parts. They are usually used as part of a mass-production scale where the same part is required thousands, or even millions of times in quick succession. There are many reasons for companies to opt for this method of production and you can read more about those in our recent blog post Why do We Use Injection Moulding?. Step one of the production process involves using computer aided technology and something called Mould Flow Analysis. It is this that allows us to analyse the proposed design and ensure that the materials and shapes used will result in the best possible product. Once the mould has been created and thoroughly tested, you will be able to start making components for the injection moulding machine. A variety of thermoplastics are available to be used in an injection moulding machine but the most common of these are: Acrylonitrile-Butadiene-Styrene ABS, Nylon PA, Polycarbonate PC and Polypropylene PP. The plastic granules are fed into a heated barrel where they can then be melted intro liquid form. This liquid is then directed through a nozzle of the moulding machine and into the cavity of the mould, which is how the parts and products take their shape. Once the liquid is in place, it cools very quickly and will be solid in a matter of seconds. The machine then opens the mould and removes the now finished component and the process is repeated as many times as necessary. Injection moulding machines are available in both horizontal and vertical variety, each bearing their own merit. Horizontal machines seem to be more popular with manufacturers in the industry, although the space-saving benefits of the vertical option is well-worth bearing in mind. The term Hopper refers to the funnel that transports the plastic resin into the barrel for injection. This resin can be in a number of different forms, including flakes, shavings or pellets, depending on the protocol of the manufacturer. The resin is then fed through manually, automatically or via vacuum subject to the materials, design or manufacturer preferences. The screw serves to both melt the plastic and inject it into the mould as it rotates, making it a vital part of the process. A series of heater bands are wrapped around the barrel in order to keep it at a high, consistent temperature at all times. All of these factors work together to ensure a smooth transition from resin to product. There are 2 platens in every injection moulding machine. These are typically made from steel and each hold a half of the mould. Once the process has finished and the product is complete, the clamp serves to open and close the mould to allow fast and efficient manufacturing throughout. 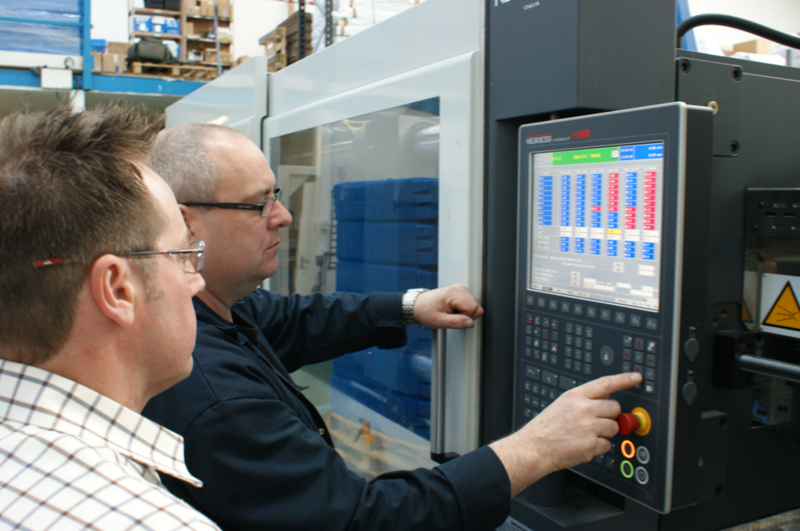 That concludes our guide to how an injection moulding machine actually works. We hope it has furthered your knowledge on what goes on behind the scenes of the production of plastic and you’ve learnt a thing or two about the technology that is required to fulfil orders. If you work in an industry that requires mass-production in short spaces of time and subject to demand, who not contact Opus Plastics today to see how our plastic injection moulding service can help transform your business. We pride ourselves on flexibility and a member of our passionate and dedicated team will be able to listen to your wants, needs and desires before recommending the types of services you will require. Previous PostPrevious What is Mould Flow Analysis?